Talking about the 'skin type' is much more customary among masses than I hear people discussing about 'hair type'. Even people having bit of knowledge will spend good time choosing a skin care product for themselves and that's really appreciative. But isn't that a dicey decision to pick right shampoo that will benefit the type of hair we have on our scalp? I agree that the key purpose of using a shampoo is to clean the dust/dirt accumulated in the hair and scalp, but I swear if we are watchful enough to decide on the appropriate washing, shampooing, lathering, rinsing and conditioning of our hair in routine, it definitely makes a difference in long run. 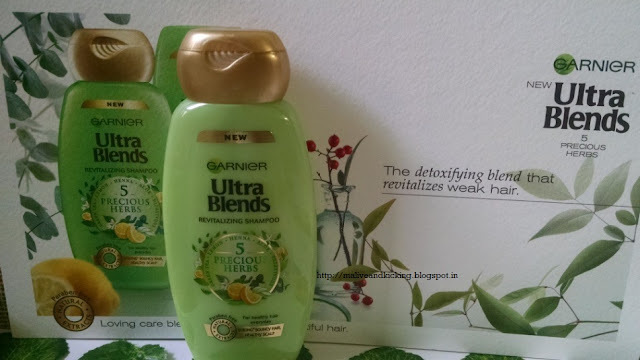 Among various good brands marketing their shampoos, Garnier is one of the leading one and I've been using and liking many of their hair care products in the past. 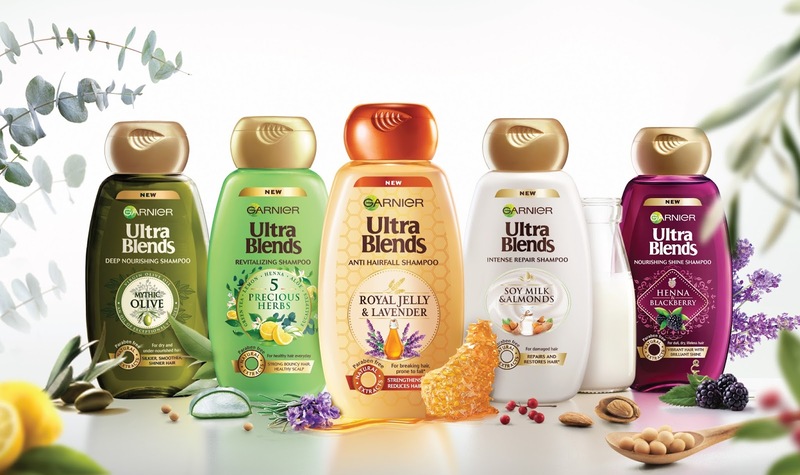 Owing to my loyalty for the brand, I couldn't turn a blind eye to their newly launched Ultra Blends range of shampoos and laid my hands on the exclusive products recently. 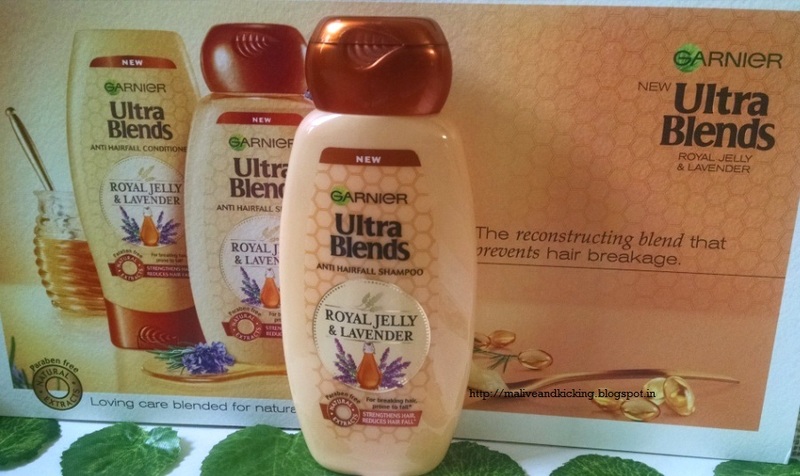 Garnier Ultra Blends believes that nature is the most potent laboratory in the world. The brand offers a complete range of blends crafted from precious natural ingredients to provide gentle loving care for hair. The indulgent fragrances and caring formulas bring to life an immersive world of naturality & beauty. Blends Introduced: A total of five blends have been introduced at present in this range. All the blends are tailor-made for each hair type. Each blend combines carefully selected ingredients in ultra-gentle and free of parabens formulas, to restore your hair's natural beauty. Variants Received: I've got four of the blends and everyone in my family including myself, have used these matching to our requirements and this is what I can say about this range now. Packaging: The packaging of Garnier Ultra Blend shampoos will leave you seriously euphoric. These flattened, plastic bottles with golden flip cap with a leaf engraved on it look really glam ;) So portable+functional and therefore travel-friendly! 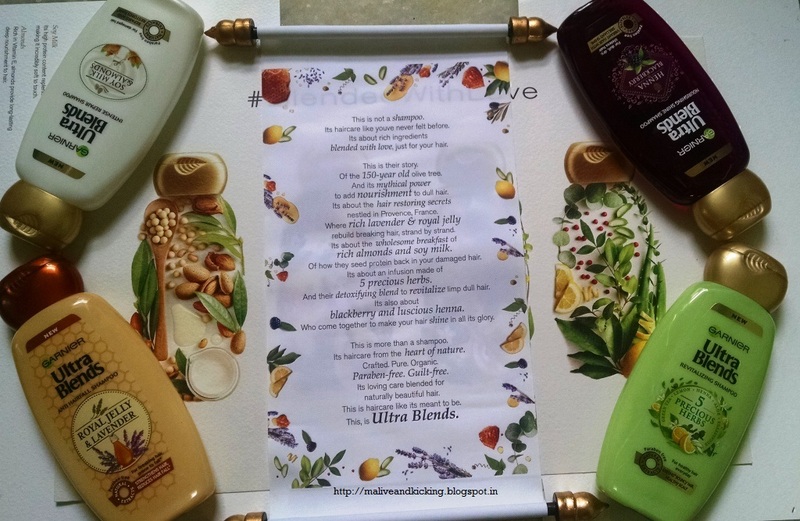 And the brand has made a brilliant effort to design the color-coordinated packs manifesting the top-notch ingredients gone into each formula onto each bottle. It also makes it convenient to pick your fav one from the washroom rack just by looking at the bottle color without need of reading carefully what variant is it. Thanks to rainy season, my hair have been a victim of weak roots and the health of scalp is undergoing worse phase these days. Royal Jelly & Lavender blend seemed most promising to my hair and Lavender being my personal fav aroma, I opted to use this blend first. Infact I've tried any Royal Jelly based product for the first time. Royal Jelly is actually an extract of the beehive that helps to fortify weak hair bcz it's rich in proteins, amino acids, vitamins and lipids, biotin etc. The milky white, creamy shampoo smells heavenly and lathered really great on my oiled hair n scalp with little extra quantity. There was no oily residue left behind post headbath. It's been easier to detangle n style my hair while I was pleased with the voluminous feel of my hair. This blend would put a halt to hair loss arising due to different reasons including caused by harsh heat of styling tools (though I rarely use those). Yet another blend made of 5 Precious Herbs viz. Green Tea, Lemon, Henna, Aloe & Eucalyptus is a winning formula. This concoction is sure to render favourable texture to frizzy and lifeless hair gradually. The capability of treating excessive scalp flaking, calming itchy scalp and conditioning the hair are the benefits that the precious herbs offer to boost the health of our hair. I'm loving the refreshing light green color of the shampoo that speaks for its herbal constituents. The zesty scent of the shampoo lifts the mood if you are feeling low & gives you a spa-like feeling in the shower. Talking about the product efficacy, its just the right amalgamation of multiple desirable properties that come along with every herb. Just after first wash, the hair strand looks bouncier and feels revitalized. 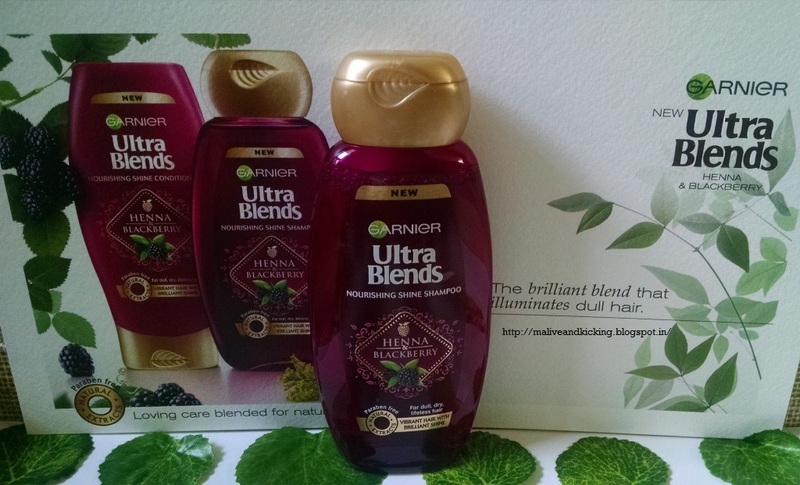 Look at the vibrant colored packaging of Heena & Blackberry blend shampoo. A real beauty to look at!! This blend was chosen by my hubby who complaints about roughness of his thick hair with unmanageable curls and I usually laugh at him saying 'how can your such short hair cause any problems?' But the length of hair sometimes becomes irrational when hair woes panic you & you definitely need a functional remedy. The less-viscous shampoo in light plum color has fruity fragrance. Unlike women with long hair, men shampoo their hair every single day and so is the case with my man too. After a week long usage of this shampoo, he acclaimed his happiness for having reduced roughness of hair without causing irritating dryness. Another trait of this shampoo that scored a thumbs up from him has been its mild fragrance. Bcz my hubby avoids stronger fragrances in shampoo and hair oils, so this blend didn't disappoint him for the reason thankfully. 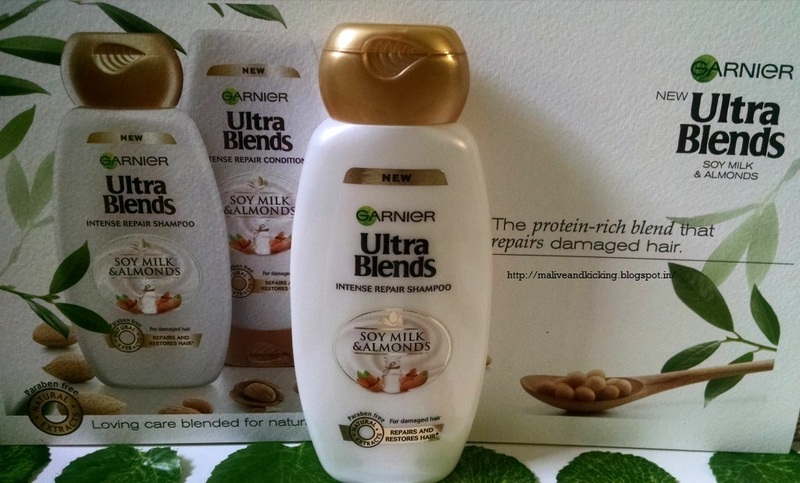 Reading all the labels on the packaging of every shampoo, I believed the Soy Milk and Almonds blend to be much humble as compared to other blends. Also when the brand ensures no use of parabens, one may go ahead using these shampoos on anyone. Considering the fact, I washed my boy's hair (which is just the replica of his dad's hair) with this gentle formulation. Since smaller hair can also attract lot of pollutants when the scalp is sweaty, this boy surely needs a deeper hair cleansing everyday. I can't actually say how he felt on his scalp, but the touch to his softer, more hydrated hair evidently proved that the care of soy milk and almonds is forming a protective & nourishing layer to maintain right texture for his hair. 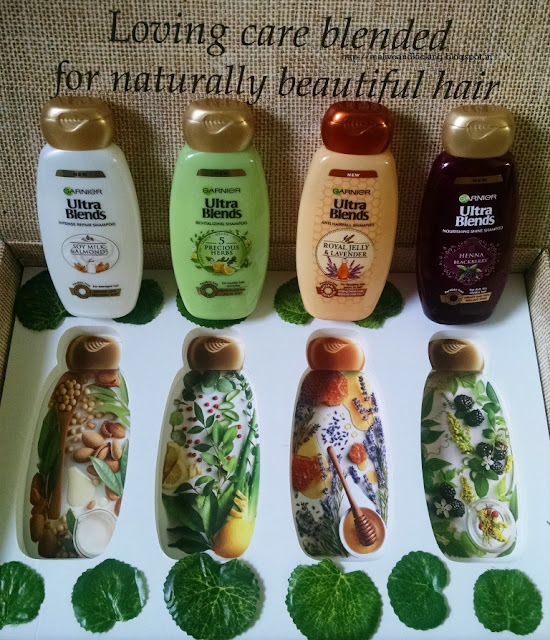 All the shampoos in the range would surely deliver what they promise to enrich your hair cleansing experience. Royal Jelly & Lavender blend is my absolute favourite. Though the shampoos fared really well, I would soon be buying the conditioners that are made for complimenting and enhancing the effect of each blend. Different pack sizes are available at inexpensive prices on many online stores like Amazon, Nykaa etc. 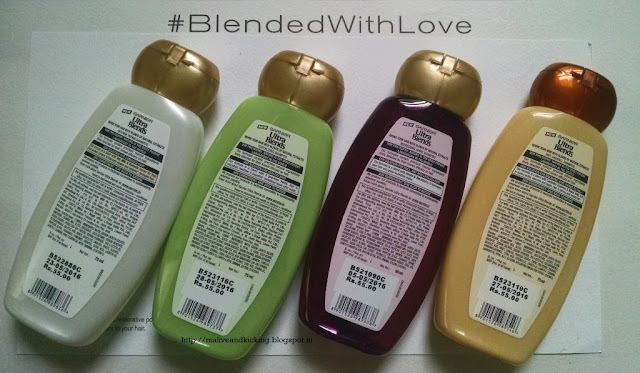 "There is a blend for every hair type. Discover yours."